New IRI Board members include Larry Roth of Cetera, Erica McGinnis of AIG Advisor Group and George Riedel of USIS. 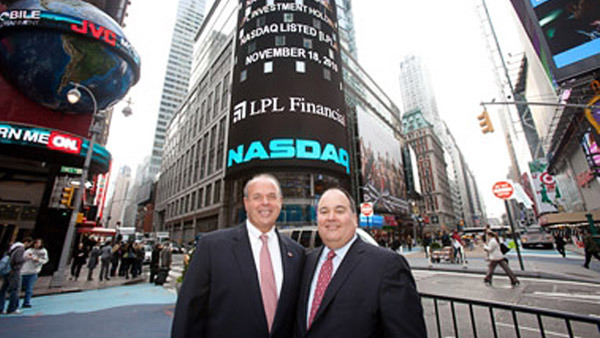 Robert Moore, left, with CEO Mark Casady of LPL. Following the conclusion of its two-day annual meeting in Williamsburg, Virginia, the Insured Retirement Institute announced Wednesday the election of LPL Financial President Robert Moore as chairman of the IRI Board. In addition to Moore, who was a quiet presence at the IRI Vision conference (and tweeted from it), three new board members were elected to three-year terms, and two were elected to fill unexpired terms on the board. The new members are Erica McGinnis, president and CEO of AIG Advisor Group (who succeeded Larry Roth in those executive positions last year); George Riedel, head of Financial Institutions for T. Rowe Price’s U.S. Investment Services; and Roth, CEO of Realty Capital’s independent BD, Cetera Financial Group. The Board members filling unexpired terms are David Cruz, head of Retail Annuities for New York Life Insurance Co., whose term will expire in 2015, and David Paulsen, president of Transamerica Distributors, whose term will expire in 2016. Headed since its 2008 inception by President and CEO Cathy Weatherford, IRI describes itself as a “national consumer coalition of more than 30 organizations, and is the only association that represents the entire supply chain of insured retirement strategies.” That “supply chain” was evident during the Williamsburg meeting, which featured speakers and attendees from the manufacturers of annuity and life insurance products and the distributors of those products, including wirehouse and independent broker-dealers, broker-dealer clearing firms and major asset management firms whose funds and managers serve as subadvisors to annuity products. Board members re-elected to serve three-year terms expiring in 2017 include Carter; Greg Cicotte of Jackson National Life; William Loehning of Fidelity Investments; Thomas Streiff of TIAA-CREF, and Will Fuller, president of Lincoln Financial Group Distribution. During the IRI conference, Fuller was one of two recipients of IRI’s first annual leadership awards, along with Kerry Geurkink of Securian Financial.